Open source provides the competitive advantage in the Internet Age. According to the August Forrester Report, 56 percent of IT managers interviewed at Global 2,500 companies are already using some type of open source software in their infrastructure and another 6 percent will install it in the next two years. This revolutionary model for collaborative software development is being embraced and studied by many of the biggest players in the high-tech industry, from Sun Microsystems to IBM to Intel. 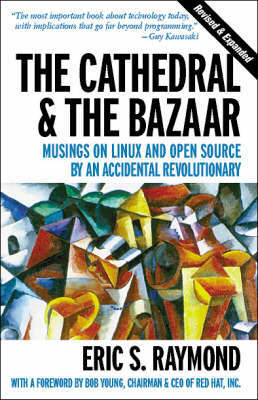 The Cathedral & the Bazaar is a must for anyone who cares about the future of the computer industry or the dynamics of the information economy. Already, billions of dollars have been made and lost based on the ideas in this book. Its conclusions will be studied, debated, and implemented for years to come. According to Bob Young, "This is Eric Raymond's great contribution to the success of the open source revolution, to the adoption of Linux-based operating systems, and to the success of open source users and the companies that supply them." The interest in open source software development has grown enormously in the past year. This revised and expanded paperback edition includes new material on open source developments in 1999 and 2000. Raymond's clear and effective writing style accurately describing the benefits of open source software has been key to its success. With major vendors creating acceptance for open source within companies, independent vendors will become the open source story in 2001.